Welcome to the QAH rabbit page. Currently we keep a small herd of around ten breeding rabbits and are constantly looking to improve on our stock. If you are interested in learning about our husbandry practices, current litters or our stock this is the place to check out! Please note some very big changes have been happening in our rabbitry recently and not all info may be up to date! I’m sorry, but we cannot guarantee genders until six weeks old. We will hold the animals of the genders you request if we have them. Litters from Rice and Lady out of Blue and Casanova! Currently our rabbitry has a fluctuating number of does and bucks as our needs and breeding program changes. As of 9/16 we maintain four rex does (castor, broken castor, opal and black otter), one rex buck (castor), and a trio of New Zealand whites. Some photos of our sires and dams are below. At Quarter Acre Homestead we believe in an animal welfare above production. While we strive for high-quality production animals, our real goal is animals that are happy and raised humanely. Our animals are housed individually in cages 2-4X’s industry standard cages, to allow a full range of activity including running, standing, nesting and digging. They are sheltered from rain and snow, but also have lots of fresh air. Our rabbits bed on a timothy/orchard grass hay which is changed and added to regularly. As such our rabbits have constant access to healthy food and water. In addition they receive a 18% protein pelleted diet mixed with various grains depending on the season and the condition of the individual animal. We supplement their diets with fresh vegetables, fruits and greens all year round, many of which are produced right here on the homestead! Our rabbits are given constant shelter and stimulation through toys and treats. They have access to consumption-safe toys and shelters to maintain healthy teeth and alleviate boredom and stress. During dry, warm weather our rabbits are placed in a rabbit tractor that allows them to forage on fresh grasses safely while being outdoors. Our does are never over-bred. While capable of producing up to 8 litters a year we aim to produce 4-5 litters a year maximum for each doe. Weaning happens around 4-6 weeks of age. Kits are handled every day and experience many people so they are well-socialized and easier to work with. Our rabbits also grow up to be healthier, hardier adults for eating a species-appropriate diet that encourages a growth of good bacteria in the stomach and proper body development. During growing our kits are kept in gender-specific pens that allow litter-mates to stay together and still provide a full range of movement and natural behavior. Our rabbits are always worm-free through an organic, natural supplement added to their feed. We avoid the use of antibiotics and all chemicals whenever possible. By being fed natural grasses and hays instead of only pellets our kits grow slightly slower but provide a leaner, healthier meat with a better taste. The rabbits eat lean food constantly at-will and get lots of exercise to produce strong, heavy muscle instead of fat. So far we have seen only incredible dressage ratios of 70% and higher out of our rabbits when butchered between 10 and 12 weeks. A few of our rabbits have dressed out at an unprecedented 82%. We generally only sell rabbits for production from pairs that regularly produce 6 or more kits per litter. If you are looking for good production animals, please feel free to inquire! If you’re interested in one of our rabbits or have any questions, please feel free to send us an e-mail! I really wish I had the space to give my rabbits this! I really do love them, even though they are meat rabbits. I go out and forage grasses for them, but I just can’t have them outside. Rabbits can be great house animals too… I have two “pet” bunnies that don’t go outside because they hate it. Sure, they’ll nibble the grass, but they’d rather you bring grass to their cages. 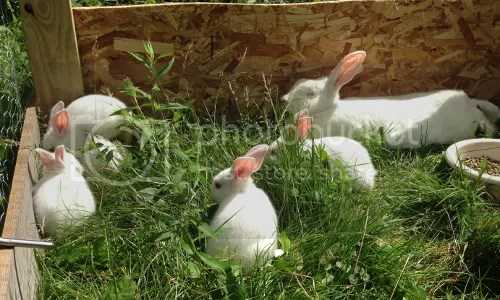 Don’t feel too bad – as long as your rabbits are well cared for and have room to move, I’m sure they’re living a good bunny life and better than any commerical rabbit! I am looking to start a production herd of New Zealand Whites consisting of two does and one buck. I am looking for good to excellent stock. Do you have any available? Hi! Our rabbitry is currently undergoing some changes from our older rabbits to a younger stock and also improving our lines. Currently we boast at least two show quality does in our new lineup, but due to the transition from older to younger stock and outfitting our facility with more cages we have no kits right now. We have several breedings lined up, including the first breeding for our show quality does, in the next couple of months. If you would like to send me an e-mail at Nyowpotopop@aol.com I would be happy to contact you when I have kits coming to weaning age! Thanks! If you are still interested we just had two excellent litters out of two quality does. Please feel free to contact me! I was really quite happy with rabbits as an option when living in a city that did not allow any other meat animal within its limits (excepting chicken which my sweetie is not a fan of at all). I love reading about your practices and agree whole heartedly that animal welfare comes first especially when we are asking so much of them. I’m glad you approve! We wok hard to keep our critters happy. Thanks for checking us out!